Halloween is right around the corner and costume planning is in full swing! Many costumes involve heavy makeup application with face paints that can irritate the skin. As a skincare company focused on improving and maintaining the health and beauty of your skin, we would normally not be fans of placing all of those chemicals and heavy foundations on your face…but how can you not? It’s Halloween! One night won’t kill you! In order to maintain its look throughout the night, costume makeup is often heavier and thicker than your every day foundation. It’s designed to give a masking effect and deposit color to your skin. Most are high in artificial coloring, fragrances, waxes, chemicals and oils. They are sweat-proof, water-proof and full-proof. Using this type of makeup can leave your skin congested and prone to breakouts after a long night. Remember to test your costume makeup out the night before Halloween on the inside of your elbow, or on a small portion of your skin. That way, if you do experience any unwanted reactions, you can look for an alternative costume makeup to complete your look. Make sure your skin is clean of any makeup from the day. Try washing with our gentle Vital C Hydrating Facial Cleanser. After washing, apply a heavy moisturizer like, Vital C Hydrating Repair Crème. By prepping your skin with plenty of moisture, you prevent many of the chemicals from seeping too deep into the layers of your skin. Think of it as a protective barrier preventing your skin from irritation and breakouts later in the night. Always apply a healthy, chemical-free base foundation that matches the color of your skin for extra protection. 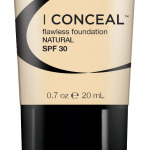 I Conceal Flawless Foundation is a great lightweight, water resistant skin foundation that heals and protects your skin. Apply some of this before your costume makeup for extra protection. Don’t even think about falling asleep without washing that makeup off! It’s the #1 mistake you can make in the care of your skin. We recommend using a gentle makeup remover first, then washing thoroughly and repeating if needed. Make sure when you wipe your face with a damp washcloth, there is no makeup residue left behind. Apply a gentle moisturizer, like the one you used while prepping for the night, and drink a big glass of water before bed.